Okay, so previously I said I wanted to make a more serious collection, but I keep steering towards more casual styles yet again. The recent release of dresses are more lady-like and more of 'Going Out' styles. I still want to make a set of 8 to 10 pieces that can be mixed and matched (like the fun editorials in Japanese magazines, where the model wears different variations over a week), and yes, this has nothing to do with themes. In addition, mother has so much skills in her, it feels like a waste making simple clothes like t-shirts and cardigans. I would like to get my mother to sew more outerwear (and yay, there's plenty of fabric for outerwear)! It's so hard to find pointelle knit fabric in shops (and rather expensive on etsy), so when I saw these two in the form of cardigans in a shop having a sale, I just went ahead and bought them in the biggest size possible. Oops, more limited edition pieces. :p The lace trims I got from a shop selling trinkets when I was on the way to catch The Avengers with a friend. (The movie's fantastic, by the way. I think Pepper and Tony Stark are made for each other!) I was so thrilled to find elastic lace, they would come in useful for socks, but then, how many socks are already available in the market? :x Will need to figure out more uses for elastic lace. Oh oh, and I love the 'wheat' look embroided mesh lace in taupe. It would make a lovely slip dress with a red cardigan. <3 I only got a metre of it, and I think I would like to go back and buy another 4 more metres so I won't regret not having enough. 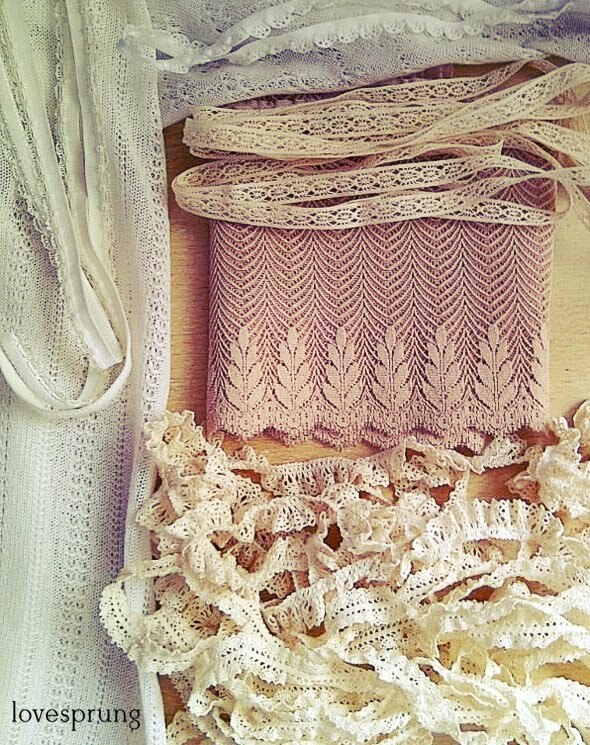 1 comment on "Shopaholic tendencies"
omg Aki I am obsessssed with that mauve lace with the wheat-like tips. Can't wait to see what it becomes! !